I dont like to think of Tom in terms of power. I think his songs held the unquenchable forces of growing living things, I think nothing had power 'over' him, he couldnt be 'caught' or tamed. His mind was totally concentrated on protecting his small piece of land, which makes me think of a genius loci more than anything else. He would be no more interested in power than a rain cloud would. That's a good description of him. I think of him as a sort of Huck Finn stowaway from the powers of the world over in Valinor. He may have plenty of power, but his interests are purely in the little world around him. In almost every culture there are myths and legends of mad hermits in the wilderness with mysterious pasts. Another example is "Old Ben" Kenobi when he is still referring to Obi Wan Kenobi in the third person. I've always felt that Obi Wan's character was stronger before the prequels robbed him of his mystery. I think that's the quality the JRRT tried to preserve in Tom B. I'm not convinced that he ever had a complete backstory, even for himself, only that he was personally satisfied there were no glaring inconsistencies that couldn't be worked out if he tried. I kind of like that way of looking at it, but I still feel he had worked things out far enough that he could say something if pressed. I just can't believe he'd sit on it for decades without thinking it through. Vanwa Raumo wrote: I do think he did have some degree of power over the Ring though, as he made it go invisible. Oh I was just paraphrasing Gandalf at the Council. "It seems that he has a power even over the Ring." "No I should not put it so... Say rather that the Ring has no power over him." Gandalf seemed to know Tom well. Or rather to be the most knowledgable about him among the council. I just sort of take his explanation of the matter as fact. Though I could be wrong. Vanwa Raumo wrote: I don't think a mere Maia would have such power to treat the Ring as a trinket. That could maybe imply that Tom isn't a Maia then. Food for thought. David H wrote: I've always felt that Obi Wan's character was stronger before the prequels robbed him of his mystery. It's sort of like the wonder of the open vistas and scenic lands just beyond the horizon. To go there is to rob them of their wonder. Though, I still love the Silmarillion even though reading it is, in a sense, "going there". Superficially the Green Man would appear to be pagan, perhaps a fertility figure or a nature spirit, similar to the woodwose (the wild man of the woods), and yet he frequently appears, carved in wood or stone, in churches, chapels, abbeys and cathedrals, where examples can be found dating through to the 20th century. The earliest example of a green man disgorging vegetation from his mouth is from St. Abre, in St. Hilaire-le-grand, c 400 AD. To the modern observer the earlier (Romanesque and medieval) carvings often have an unnervingly eerie or numinous quality. This is sometimes said to indicate the vitality of the Green Man, who was able to survive as a symbol of pre-Christian traditions despite, and at the same time complementary to, the influence of Christianity: rather than alienate their new converts, early Christian missionaries would often adopt them as saints. In Thomas Nashe's masque Summer's Last Will and Testament (1592, printed 1600), the character commenting upon the action remarks, after the exit of "Satyrs and wood-Nymphs", "The rest of the green men have reasonable voices...". 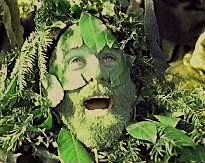 Parallels have been drawn between the Green Man and various deities such as the British Celtic Lud, also known as Nodens. Many see him as being connected to the Mesopotamian Tammuz who is thought to symbolize the triumph of Life over Winter and Death, Osiris, Odin, and even Jesus, as well as later folkloric and literary characters such as the Holly King. A character superficially similar to the Green Man, in the form of a partly foliate mask surrounded by Bacchic figures, appears at the center of the 4th century silver salver in the Mildenhall Treasure, found at a Roman villa site in Suffolk, England; the mask is generally agreed to represent Neptune or Oceanus and the foliation is of seaweed Neptune or Oceanus and the foliation is of seaweed. Figures such as the Jewish prophet (Elijah) and (Khidr), Muslim prophet of eternal life, Cernunnos, Sylvanus, Derg Corra, Green George, Jack in the green, John Barleycorn, Robin Goodfellow, Puck, and the Green Knight all share aspects of the Green Man's nature; it has also been suggested that the story of Robin Hood was born of the same mythology. A more modern embodiment is found in Peter Pan, who enters the civilized world from Neverland, clothed in green leaves. Even Father Christmas, who was often shown wreathed in ivy in early depictions, has been suggested as a similar woodland spirit. The Green Knight of Sir Gawain and the Green Knight serves as both monster and mentor to Sir Gawain, belonging to a pre-Christian world which seems antagonistic to, but is in the end harmonious with, the Christian one. In the Germanic nations, such as Germany, Iceland, and England, depictions of the Green Man could have been inspired by deities such as Freyr or Odin, as both have many attributes of the later Green Men from throughout Europe. Etymological research by the University of Wales into the meaning of the names of Celtic gods and goddesses shows that one Celtic deity, Viridios, has a name meaning "Green Man" in both the Celtic languages and Latin. There are legends of him (Khidr) in which, like Osiris, he is dismembered and reborn; and prophecies connecting him, like the Green Man, with the end of time. His name means the Green One or Verdant One, he is the voice of inspiration to the aspirant and committed artist. He can come as a white light or the gleam on a blade of grass, but more often as an inner mood. The sign of his presence is the ability to work or experience with tireless enthusiasm beyond one's normal capacities. In this there may be a link across cultures, …one reason for the enthusiasm of the medieval sculptors for the Green Man may be that he was the source of every inspiration. I dont know if you have seen the 1991 Robin Hood film with Patrick Bergen as Robin and Uma Thurman as Marian, but the very last scene is the best vision of how I imagine Tom in all of cinema history. Its him. So if Hargrove is correct (and in this case I think he is), Tom must fit into Tolkien's constructed universe, if only the readers can figure out how. But can't an anomaly be an enigma? 'Enigma 1. One that is puzzling, ambiguous, or inexplicable'. That's the definition I found anyway. If Tolkien used the word enigma then why is 'anomaly' necessarily out? This may be more Hargrove's definition than the generally accepted definitions. But if we leave Tolkien's use of 'enigma' aside, I still think Hargrove's point that it's not in Tolkien's nature to leave something that doesn't fit just laying around in that state for decades, then I think he had a niche for Bombadil, he wouldn't fall outside the schema that everything else fits into. Looking things up myself, I think the key is to focus on the idea of 'anomaly' as a 'deviation', while an 'enigma' is just puzzling or not understood. ... nor to tell himself it seems, at least on paper, as there are (to date) no private texts which show Tolkien trying to figure out an answer for himself, which JRRT would never have known might be published in the future of course; nor any letters that pop Bombadil into some easy category -- letters which are only meant for one person usually, and which Tolkien never expected would be made public either. Hargrove points out the Glorfindel text -- although he or she wrongly attributes Tolkien's desire to explain things here to a nomenclature problem which didn't actually exist -- but in this case, yes, we have text. Hmm...the private text thing is an acute point that hadn't occurred to me: Tolkien seems to have worked out everything on paper, and there's no way any mention of how Tom fits into the framework would have escaped notice. This makes me more willing to accept that perhaps Tom really is an anomaly, even to the author. Actually I shouldn't say that so quickly. Rather I don't recall any texts written after The Lord of the Rings was published, but I must admit I didn't look at any Bombadilian draft texts. It any such reference to Bombadil was extant, it would have been instantly propagated around the globe. It's too good to resist. Come to think of it, Tolkien never attempted to fit Hobbits into his mythology either. Perhaps he felt no need to fit in anything that wasn't part of his original spate of creation that produced the Silmarillion. Hobbits were forced upon him by the publisher and a chance bit of whimsy; Tom was forced upon him by his children. Not that he was unhappy about it, there was just no need to shove them into a pre-created framework. I guess I'd think of the legendarium as a trellis upon which Tom and the Hobbits can play: it has to be strong enough to support them, but they are not part of it. BTW, Gene Hargrove is a He. Professor of philosophy at North Texas state. halfwise wrote: Hobbits were forced upon him by the publisher and a chance bit of whimsy; Tom was forced upon him by his children. Not that he was unhappy about it, there was just no need to shove them into a pre-created framework. I guess I'd think of the legendarium as a trellis upon which Tom and the Hobbits can play: it has to be strong enough to support them, but they are not part of it. Even so, their inclusion can be theorized within the mythos. It's not perfect, but it can work. Tom's possibly a Maia. The Hobbits were maybe just not noticed by the Silmarillion's narrator, assuming the narrator isn't omniscient. Yep, but for me the question is whether Tolkien had worked them into the framework in his own mind or not. Elthir's point about there being no written record (among the sheaths of stuff Christopher Tolkien dug up) has finally convinced me that he wasn't interested. Perhaps things fall into two classes: the mythology he was creating before the Hobbit, and the more random ideas that came after. I start to feel that he just didn't care to bring Hobbits and Tom into the very independent framework of the mythology: they were just hung like paintings on the wall; they weren't structural.